Who will win, Santa or The Easter Bunny? 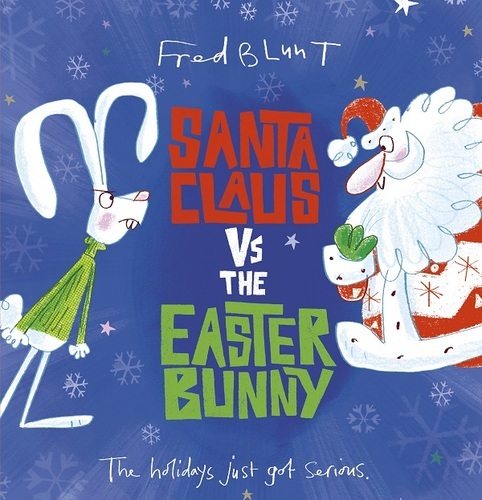 Get a peek behind the scenes and find out how the holidays really happen in Fred Blunt’s brilliant new picture book Santa Claus VS The Easter Bunny! The book follows what happens when the Easter Bunny, resentful that Santa has the easier job, devises a devious plot to get even. Andersen Press have a fantastic, festive competition. You could win a signed copy of Santa Claus vs the Easter Bunny, plus a bundle of hilariously funny picture books! All you have to do is design a new kind of toy. CLICK HERE to download the competition sheet and design your toy. Scan and email your competition sheet to Kimberley.Sheehan@readingagency.org.uk with the subject line ‘Santa Claus Vs The Easter Bunny Competition’. 1. The competition period will start at 9am on 9 November and end at midnight on 31 December. After this date no further entries to the competition will be permitted. 2. To enter, entrants should send their entry to Kimberley Sheehan, The Free Word Centre, 60 Farringdon Road, London, EC1R 3GA or email it with your name, address and age to Kimberley.Sheehan@readingagency.org.uk with the subject line ‘Santa Claus Vs Easter Bunny Competition’. 3. The Competition is open to children aged 13 and under on 31 December. 9. Andersen Press shall not be responsible for any inaccurate contact details provided by Qualifying Entrants/Winners in accordance with paragraph 8 above, which results in the Prize not being delivered. 10. Andersen Press’s decision will be final and binding. No correspondence will be entered into.